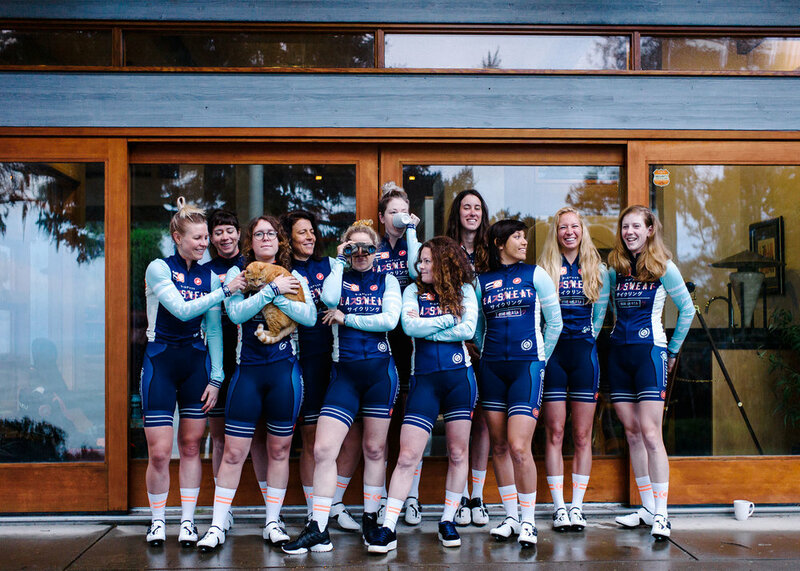 LA Sweat is a Criterium-Focused female race team -- races include criteriums on the US Pro Road Tour and fixed gear criteriums part of the Redhook Championship Series. LA SWEAT FACT: While the team began in LA, and the majority of the roster was based, 4 years later, not a single rider resides in LA - not even the founder. So feel free to pronounce the team name La Sweat, if that helps. LA SWEAT Fact: 60 percent of the team, if given the choice, would be a unicorn. 40% would be a mermaid. LA Sweat FACT: In 2015 the squad traveled to almost 50% of the states in the United States as well as British Columbia, London, Milan and Barcelona. LA Sweat FACT: The team means business on and off the bike. The team has over 60,000 personal social media followers. That's a lot of impressions. In three years the team was featured in nationwide magazine and mega-popular blogs including getting the cover of Bicycling magazine. LA Sweat FACT: The team does real good nails.